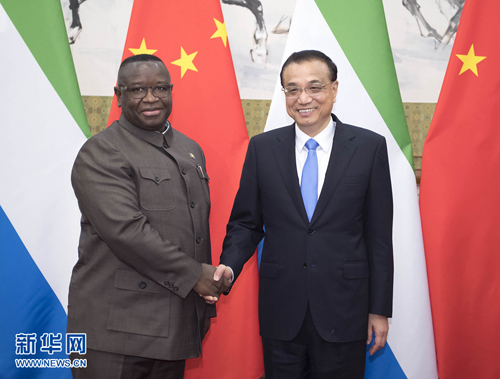 BEIJING, Sept. 2 ,Chinese Premier Li Keqiang on Sunday met with Sierra Leonean President Julius Maada Bio who is on a state visit to China and will attend the 2018 Beijing Summit of the Forum on China-Africa Cooperation. Li said China is ready to strengthen cooperation with Sierra Leone on trade, investment, education, health and other areas. He also called on the Sierra Leonean side to provide more favorable policies to attract investment from Chinese companies. Bio thanked China for the sincere assistance during Sierra Leone's fight against Ebola, and expressed willingness to learn from China's governance experience, expand cooperation in trade, investment and financial sectors, and further deepen bilateral relations.